we're expert at WordPress web design, in case you're not. also one of the most stable and secure. WordPress represents one of the most popular open source methods of managing your web presence. 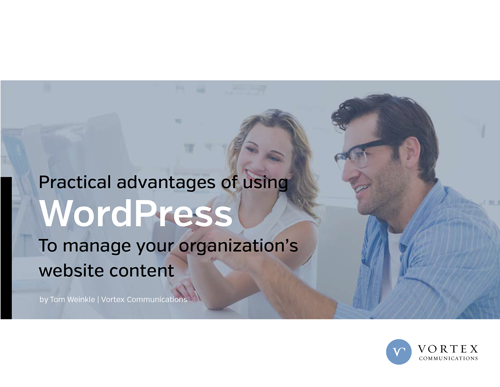 Small and medium-sized organizations can manage online content easily through a “no programming knowledge required” interface. Adding special functionality such as multiple languages, ecommerce, registration forms, landing pages or “member-only” content areas is a snap. And there’s more to our WordPress services than meets the eye. Before we tell you what needs to be done, we’ll review your existing site’s stats or plan a new one from scratch. As print and digital branding professionals, we have the know-how to build high levels of brand engagement into the web design. We can port existing content or develop new material and wrap it in a completely custom or off-the shelf framework. We take a team approach to everything we do, so you’ll have plenty of opportunity to provide feedback from interface design through site launch and beyond. We can develop and implement a blended approach of organic SEO and PPC to get your new site noticed by everyone you want. We teach you how to manage any or all of your content using a friendly, patient approach. It’s never to late to learn, and we’re always happy to teach. Everyone needs an upgrade now and then. We keep your WordPress web design running right, with little to no interruption of your online marketing activities. We’ve even written a book about the advantages of wordpress Get a copy with any request for proposal.